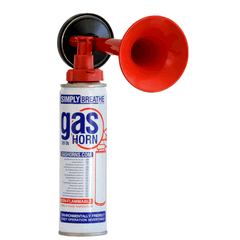 For fog, rescue or any emergency signalling, a gas horn is an essential part of every vessel's safety kit. These safe and non-flammable gas horns are extremely loud and reach 120 Decibels meaning they can be heard up to a mile away. As well as top quality sound, another advantage of these horns is that they are extremely easy to assemble with a push button activator making the horn reliable and simple.